The Funky Felter: Another Storque Article: Confessions of a Jan, being an Etsy Middle Child! Another Storque Article: Confessions of a Jan, being an Etsy Middle Child! I recently had another article featured by Etsy's online blog, the Storque. My first featured article was about felting trends and the felters of Etsy. For my second article, I interviewed four sellers that are all middle children of Etsy like myself. Say it loud, say it proud "I'm a Jan!" - not a cute newbie and not a seasoned top seller on Etsy, but rather somewhere in the middle in Etsyland. 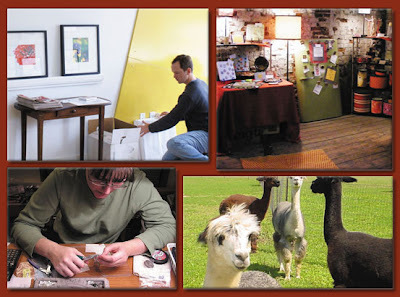 The people behind the Etsy shops of NorthStarAlpacas, ScottGarrette, CastoCreations, and DumbKidDesigns all volunteered to share their "Jan" experience with me. Here's the intro..................but you'll have to visit the Storque article for the rest, and please do make a comment here or there. I'd love to know what you think of it. Also, there is a thorough list of links at the end to help you improve your Etsy shop and arts/crafts business. "Do you ever feel that you're kind of in the middle — not an Etsy newbie, but not an Etsy top seller either? So maybe some days you're a little like Jan of the Brady Bunch crying 'Marcia, Marcia, Marcia!' at those envious and admirable top sellers because we all know, at this point that, you're certainly not as cute as those newbie Cindy's out there who are just starting. Nonetheless, you may be feeling a bit like Etsy's middle child at a crossroads of decision making at the beginning of 2008. I find myself personally to be in this middle area (just call me Jan) where I'm trying to decide whether or not to take my business to the next level from part-time hobby business to full-time business, or whether to just enjoy it for what it is. Some of you may also feel the same. Come on, confess if you're a closet Etsy Jan! There is no shame in finding your way as an Etsy middle child.........."
Go to my Storque Article to read more! Fantastic article! You pretty much nailed how I feel!